You can make purchase for the above item at iTunes Store. *The data downloaded from Itunes can only be played on certain devices, such as iPod and computers. The sale of this audiobook is part of this Movie Project. We created this audio book in order to raise funds for the project. Mr. Enrique Barrios, the author, has kindly made us an offer to donate all the fee for exclusie rights for making Ami into movie for the first sales year. All the profits raised (excluding production cost and business expenses) will be used for this Project. Mr. Barrios and we trully hope that you all understand that by purchasing this audio book, you will make great contributions to our activities. 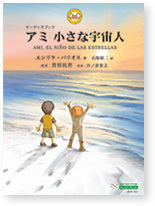 If you wish to read "Ami: Child of the Stars" in English, plaease help yourself at "E-books Available" on Mr. Barrios' official website.